“Starting life as a humble molecule in the Pre-Cambrian age, you progress through this exciting ten-level game to the Dawn of Early Man – if you are clever enough! 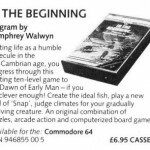 A C64 only title which sounds very interesting indeed, but one which has never surfaced. It shows up as missing within Gamebase, so it is known about – but did it ever get a release? So this is no longer a GTW, but we’ll keep the entry until fully recognised in Gamebase64. I used to have this game, I can’t remember much about it, only that the cover may have been beige in colour and on the back warned of a 13 minute loading time!